A found a good quilt shop. I know it shouldn't be a news item, but trust me. It is. I've had far more negative experiences of quilt shops than positive, so when I do find a good one I like to share the information. I was in need of some supplies that my local show is out of stock of, and despite me keeping pretty good stocks myself I am out too. I happened to be going to Kent and I remembered that there is a quilt shop in Sevenoaks. Being stuck in traffic has it's uses, I had time to remember the name of the shop too, Puddleducks (see something does sink in from the ads in the quilt magazines). out with the trusty phone and I shortly had a website and from that an address and phone number. Yes, people really do use this information. I had a little trouble finding the shop but that was due to the postcode look up giving me the wrong address and me not spotting it. Follow the advice on the site and park in the public car park it is really cheap. Unusually for a quilt shop, someone appeared quickly and said hello. Maybe this happens to other people but it doesn't often to me. She was keen to help and very friendly. Unfortunately they didn't have what I needed either but I did get some fabric. I nice batch of batiks for one of my new big projects and some more blacks and greys. While I was there a couple of other people came into the shop. I think one works there and the other was just a customer, but they were both lovely as well. Very welcoming. The shop was also happy to let me use the loo. Maybe not a big deal but when you have a long drive home in rush hour traffic it is very much appreciated. Now before you think that maybe the shop had seen the recent article about me and were being nice because of it, they hadn't. This shop is just full of nice people. It's so nice to be welcomed in a quilt shop, and to be able to recommend a shop. If you are in the Sevenoaks area do give these guys a visit, you might also like to look into their range of courses. I believe they do quite a few and have a classroom behind the main room of the shop. Just in case you missed it earlier their web site is here. There's a rat in the bin! I know many people have cats that hunt. I am sure many of them collect rats, and much as I love pet rats, I'd rather not have the wild ones too close to my house, sorry. So this morning when I walked into the bathroom and found one, dead, I wasn't entirely surprised. I did clear it up though. Distressingly the bathroom still smells of dead rat tonight. I had been pondering what to do about it when Tet came home. I mentioned this to him. "Yes", he says "it would". "The rat is still in the bin". I had told him this morning about the rat. The thing is I didn't put it in the bathroom bin, it would smell. It seems however the cats would. It's nice that they disposed of their trophy so neatly, but how do I train them to put it in the kitchen bin, or better yet outside? As you may know I have a gallery space at the Festival of Quilts this year. This is a great opportunity, but it does mean I need to make a large amount of new work to display there. My larger art quilts often occupy the frame for extended periods of time so I will have to reduce the number of customer quilts I take in between now and then (August). As you will know if you've had me work on your quilts I don't like to keep customers waiting, so I've come up with a reward scheme for those who will help me reduce the number of quilts I need to work on immediately. If you contact me before the Festival of quilts, to have a quilt quilted after the show I will give you a 15% discount on your bill. If you have work that really needs to be done sooner, I will try and fit you in but it will be at full price, and the turn around may be a little longer than usual. I am hoping that this will help everyone. I will get the time I need for my own work, urgent quilts will be done as required and the rest of my customers will get a bonus for their help and support. It will also mean I can put on a far more interesting show for everyone with lots of new quilts to see. Isn't this just amazing? No? Have a closer look at this address label. It's stitched. It arrived this morning in clear plastic so it could be seen on the outside of the package. 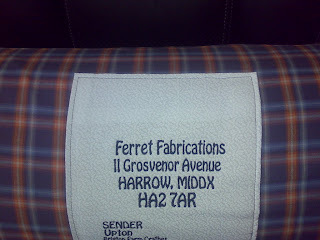 The package contained some quilts that a friend was returning to me. My quilts have never had a proper quilt bag before, let alone one with a proper label. It's time for my irregular reminder to think about how you will wash your quilt before you make a monster. It really is worth the time to see if the three parts fit before you quilt them together. Most king size quilts will fit in a domestic washing machine but you may need a thinner wadding. The one that currently has me at the laundrette had two quite thick cotton waddings in it. It is a lovely warm winter quilt but a bit of a pain to wash. In fairness my closest laundrette has been upgraded since I was last here. New high capacity high speed machines mean it takes 30 minutes to wash the monster quilt and all the other bedding. I think the machine would have taken two of those quilts in one go if I had two. As ever I've met a nice and intersting person here too, so I can't really complain. Still if you don't want to be doing this, check before you quilt. I didn't ask to be ill, really I didn't. Still I seem to be largely winning against the cold other than the sneezing. I've realised again today that I am very much a quilter though, I've been trying to take it easy and do some piecing which is less physical and therefore might help me fight the cold. All I can think about is getting back to the frame for some serious quilting. Doh! I've just got too many great projects to be working on. Spoilt for choice. I had been going to brag about the new photocopier I bought today. It seemed pretty exciting, and will save me a lot of time and effort but something way better has come up. I've mentioned my friend Cy Dethan, the writer. Well his latest project Cancertown will be out soon (it's already available for pre-order) and he has just had the foreword completed. Not excited yet? Well it's been written by one of my favorite writers Bryan Talbot. That is just amazing. Cy has posted the foreword on his blog if you would like to read it. Be warned, than language is quite colourful, this is the introduction to a horror/fantasy comic and has been written accordingly. You have probably noticed that bad things tend to come in groups. You rarely seem to have one thing go wrong you always get a cascade right. Well I would suggest that good things can do this too. I don't know if you remember me talking about a quilt I worked on that was to raise money for Macmillan nurses? Well it raised over 2000 pounds! How cool is that? I am thrilled to have been involved in it. It looks like I will have to ask them nicely for a picture of it, it seems I forgot to take one. Doh! I was really pleased with the quilting on it too. It was decided I aught to take some time to work on something just for me. I don't often get the chance now. I seem to have been a bit obsessed with broken stars recently so that is what I have started on. The middle 8 diamonds are done, and the strips prepared for 3 more. The whole quilt will need 32, who knows when I will have time to make those. It does seem to have quitened that obsession though and I am really looking forward to quilting it. I am thinking of making it a very wide but not verry long, maybe 120" wide and about 80" long. I have noticed the cats taking up an increasing amount of quilt and the 100" wide one simply isn't big enough. 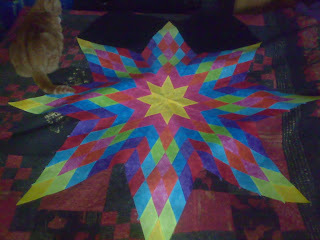 To extend the quilt like that I think I will need to add extra borders to two sides. This seems an ideal oportunity to add more stars. I can't help it, I love stars. Anyway to bed, I am teaching frame quilting tomorrow so it's going to be a hard day. I still have places on my three part course 'A quilt of your own'. 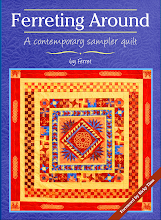 This course will take you through designing and planning your own quilt. Help will be offered with block choices, setting, sizes and methods of construction. I am finding more students are having a go at making something up for themselves, and this course is intended to provide the support and assistance for those trying this for the first time, or trying something more complex then they have in the past. It can be booked online at the link to the class. Today has been very odd. I've been teaching my book quilt for a year now, and I had thought I largely let students get on with it. Apparently not. I guess thinking about it I do watch the classes (well I am there to teach) and I am very aware of anyone having to think too much, that frown just before you get stuck. So what has been causing me the confusion today? The book is getting it's toughest test. 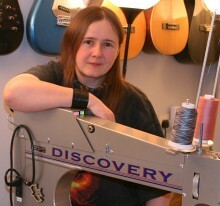 A non quilter working through it. The hard part for me is I am banned from interfering. Yes, this will make a better book. Yes I really want to do it, but boy it feels strange. It's also proved to be a way to find new and interesting problems. The strangest was freshly made bias tape unfolding. I've seen lightly pressed tapes coming a little unfolded, but even the one I pressed had completely flattened out. I'd never seen anything like it. I was all ready to blame the fabric, we had tried everything else, when it dawned on me what was different. I press a strip then hang it near my cutting table before pressing the next. My tester was leaving them on the ironing board. On the surface a much more sensible solution, less walking too and fro. However with a mesh top ironing board and a steam generator iron you get enough steam coming up through the board to neatly steam out the folds you just put in. Doh! Not a problem I would ever have encountered in a class as the boards there all have solid tops, but one a beginner could easily find at home. If nothing else it has proved that this testing is worthwhile. Other than that I am looking forward to a very busy week. I've got a lot of customer work that needs to be delivered Tuesday or Wednesday this week. Fortunately they are all quite fun quilts, and I've got most of them done over the last couple of days. I've got two workshops this week as well as the regular classes and in between I want to write another couple of chapters of book two. I don't think I am going to get a lot of blogging time unfortunately. On the other hand I might be able to photograph some of the customer work and put that up later in the week, it depends a lot on how hectic the teaching is. The downside of being this busy is I've missed another quilt show. I had intended to put a couple of quilts into Malvern, but the deadline was yesterday. I am concentrating so hard on the Festival of Quilts, other competitions just aren't registering.